Srinagar, Indian-administered Kashmir – At least one soldier has been killed and several people have been wounded in a fierce gun battle as fighters stormed an army base in Jammu city of Indian-administered Kashmir, according to local officials. Officials said an unknown number of attackers are cornered inside the residential complex of the camp, where they are locked in a fierce standoff. Hundreds of police, army and paramilitary soldiers were called in to dislodge the fighters, who have barricaded themselves inside multistorey buildings. 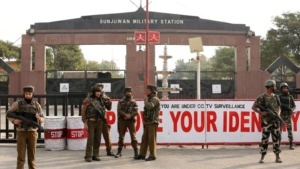 The vast army installation located in the city of Jammu is located close to several shopping centres and schools. Speaking to Al Jazeera, an official from the civil administration said the nearby schools had been closed as a precautionary measure and security was beefed up across the area. “The situation continues to be tense. The attack has taken place in the main city. The exchange of fire is still on,” the official said. Earlier, the army said in a statement that one junior commissioner officer had been killed in the gun battle during “operations to evacuate families”. “Six persons, including three women and children, have suffered injuries,” the army said, adding, that due to the presence of women and children in the housing colony, “the operations are being progressed cautiously to minimise the causalities”. Indian Home Minister Rajnath Singh said he was closely monitoring the situation. The attackers are suspected to be affiliated with Jaish-e-Mohammad, a Pakistan-based group which has launched similar raids in recent years against the army and paramilitary installations across the region. Jammu is the main city in the southern part of the disputed state, claimed by both India and Pakistan in full. The archrivals control parts of the Muslim-majority Himalayan region. Cross-border firing in violation of a 2003 ceasefire agreement has gone up in the past months leading to causalities, with more than a dozen people killed on the Indian side since the beginning of this year. The two nuclear-armed neighbours have been at loggerheads since an attack on an army camp in Kashmir’s Uri left 18 Indian soldiers dead in 2016. New Delhi regularly accuses Islamabad of aiding fighters in crossing the de facto border (Line of Control) to attack targets inside India. Pakistan denies the allegations and stresses that it only lends moral and diplomatic support to Kashmiris.